I had a pizza date planned with a friend for this past Saturday evening. I did everything I could to plan for it: made sure my husband had a decent dinner to eat on his own, went on a long run, salivated. And then she canceled. All of the sudden I had to cook dinner, but I couldn’t get pizza out of my mind since that’s what I’d been looking forward to all day. I certainly wouldn’t have been able to order this pizza at the Pizza Hut I was scheduled to attend, so I certainly wouldn’t have enjoyed dinner as much as I enjoyed this pizza. And thank goodness for Smartphones. I ran into the grocery store on the way home from my cancelled dinner with no inspiration. I saw asparagus was on sale, instantly remembered seeing this recent blog update on Confections of a Foodie Bride, and had dinner planned. I checked the ingredients in my Google Reader and dinner was set. The truth is that this pizza was really high maintenance for me to make since my favorite vegetable peeler was MIA (???) and my batch of asparagus was particularly tender and thin, making it hard to shred. I persevered, though, and would do the chore two times over to have this pizza again. It was fantastic. The sun-dried tomatoes, a last minute impulse decision, made it just fantastic. My husband, who had requested pork tenderloin for dinner (naturally, I turned that down), didn’t even miss meat on this pizza. Moreover, he’s not one to like gourmet pizzas, but he adored this meal, perhaps even more than I did. Yes, we ‘fought’ over leftovers. Preheat oven to 450 degrees. Place your pizza stone in the oven 1 notch higher than midway in your oven. Zest and juice lemon, placing zest and lemon into a large bowl. Add olive oil. Whisk to combine and season with salt and pepper. Using a vegetable peeler, shave asparagus into thin slices and place in the bowl with the lemon juice. Toss to combine. Roll prepared pizza dough out to a 12-14″ round. 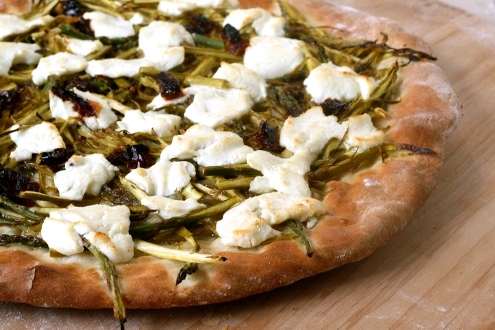 Using tongs, lift dressed asparagus out of bowl and pile onto pizza dough. 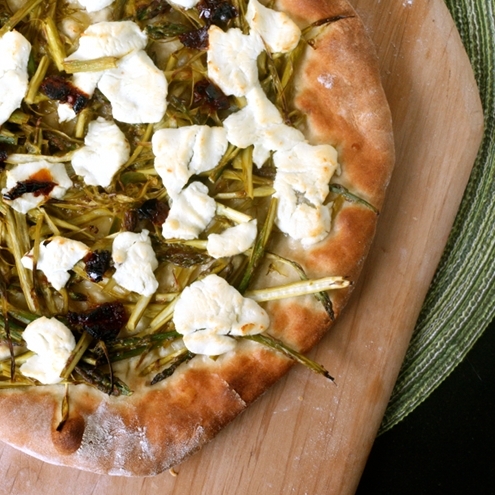 Dot entire pizza with dollops of goat cheese. Sprinkle pie with sundried tomatoes. 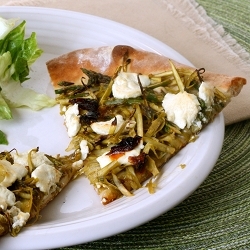 Bake in your very hot oven for 10 minutes or until crust is browned and cheese is bubbling. This entry was posted in Advice, Brady Evans Venables, Columbia, Famously Hot, Food, Lexington, Lexington Medical Center, Midlands, Recipes, Women and tagged Brady Evans Venables, Columbia, columbia sc, cooking, every woman blog, Famously Hot, food, hospital blog, Lexington, lexington medical center., lexington sc, Lexington Women, lmc, LMC every woman blogger, Midlands, Midlands Women, Pizza, South Carolina, South Carolina Women, Women, women's blog, women's hospital blog by Ashley Andrews. Bookmark the permalink.